I don’t know what would be more exciting…. winning a Grand Prix over a competitive field of 43 and having a pay-day of $60,000… or being surrounded by Lamborghinis! Not only did Chris Pratt & Cruise win the Grand Prix, but fellow Canadian John Pearce & Chianto (part of the 2010 WEG Team) was just over a 1/2 s. away to take 2nd place honours and Jill Henselwood & George (part of the 2011 Pan American Games team) claimed 4th. 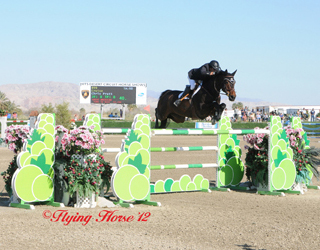 Even more impressive is that Chris & Cruise won the previou weekend in the $25,000 SmartPak Grand Prix. All 3 are declared for the 2012 Olympic Showjumping team (full declaration list here). Between the results of riders doing the California circuit, and those who are based in Wellington doing the Florida circuit, it makes for some exciting showjumping action!